Representing some of our personal favorites, this collection of Individual Departures is the culmination of 30 years of fine tuning and focus. 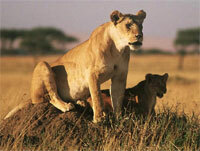 African Travel, Inc. prides in providing well paced, low density tourism with an emphasis on a singular experience. While some of these departures offer multiple levels of luxury, you can be assured only the best hotels with proper ambiance and location are suggested. Nothing is written in stone. Every safari has been designed with inherent flexibility. In fact, you will find with each program some recommended extensions that will add seamlessly to your itinerary. Unique to African Travel, the definition of a Small Group Departure is one that operates with a minimum of 4 and a maximum of 12 guests. African Travel brings together like-minded travelers who enjoy meeting and sharing their experience. The group dynamic can provide an energy and exchange that, for many, is an enhancement that is missed when not in the company of other adventurers. Dates chosen for our Small Group Departures are for the most popular travel periods with wildlife and weather in mind. The Off The Beaten Path programs provide alternative travel adventures down 'the road less traveled by' to enrich and enhance your African travel experience. These special interest itineraries may require a certain degree of stamina but your extra effort will reap immeasurable rewards. So, veer off the tourist trail and discover the delights that are in store when you take the path 'less traveled'. These journeys have been designed so that they can stand alone or as a compliment to one of our Individual or Small Group Departures. Expand your experience with this collection of traditional and non-traditional Extensions designed to supplement the Individual or Small Group Departures. To this end, we offer with each tour program our suggestions for embellishing your journey. These extensions are not meant to stand alone, but rather to provide additional choices of African highlights that will carry your journey to a new level. These choices offer you the option to hand-pick elements to add to your safari, thus adding the personalized touch that transforms a vacation into a trip-of-a-lifetime.